“One of the charms of foam is its aesthetic appeal. The evanescent beauty of bubbles has put them into works of art and the association of foam with tossing seas gives it a special place in mythology, which engenders its own art. Aphrodite, Greek goddess of love and fertility, and her Roman counterpart Venus sprang from sea foam, as captured in Botticelli’s painting The Birth of Venus. Botticelli’s contemporary Leonardo da Vinci was drawn to foamy turbulence, delighting in drawing huge splashes full of foam and white water. (Being Leonardo, he also made scientific studies that relate to the nature of bubbles. )” 1Sidney Perkowitz, Universal Foam: Exploring the Science of Nature’s Most Mysterious Substance, Anchor Books, New York, 200, pp. 4-5. “Je ne cherche pas, je trouve!” 2Translation: I’m not looking for, I’m finding! These are words of Pablo Picasso. In September 2001, I was invited by the founder of “Sky Art”, artist Otto Piene, and the former Director of Massachusetts Institute of Technology’s Center for Advanced Visual Studies 3C.A.V.S. was established at M.I.T in 1967, about the same year that E.A.T (Experiments in Art and Technology) was actively pursuing projects in the New York area. C.A.V.S and E.A.T shared the same goal: exploring the possibilities of creative works with the tools of Technology., physicist and inventor of the “rainbow hologram” 4Photonics Dictionary http://www.photonics.com/dictionary: a rainbow hologram is essentially, a hologram of a hologram, in which the first-generation hologram is masked with a narrow slit. During image reconstruction, the slit operates as the exit pupil in image space. The hologram’s white-light exit pupil is spread out to form a spectrum by the grating’s dispersions - the "rainbow" from blue to red., ever-memorable Stephen A. Benton, to conduct postdoctorate artistic research with the title (Nephele)3, Nephele to the third power. In Greek nephele means “cloud”, and the objective of this project was to realize what seems unrealistic and crazy: a cubic cloud, a cloud delimited in space by six square invisible planes (for this research I had received a Fulbright Grant and a Research Scholarship from the Hellenic Government). During this collaboration with scientists and engineers at MIT, I had the chance to see a small piece of silica aerogel. I was so surprised by the appearance of something that one is not quite sure is there! To believe your eyes, you need your hand, not only to touch, but also to handle, to move around, to press the material… thus you discover that this “frozen smoke” is so lightweight and fragile. Immediately, I thought of creating immaterial, ethereal sculptures with it. I knew nothing about this material and the difficulties of its expensive fabrication, but I was certain that I had something important to do with it. As we know, aerogels are excellent thermal and sound insulators because 99.98% of their volume can be pure air. Aerogels are the lightest solids ever produced and in May 2002 received the Guinness World Record as the least dense solid in the world 5http://www.guinnessworldrecords.com Science and Technology/Amazing Science/Least dense solid.. The silica aerogel is an amorphous form of common sand, nonflammable, nontoxic, and environmentally safe. In this paper, I will focus on silica aerogels because of what the combination of silica and air offers to a work of art made out of this amalgamation: poetic, aesthetic, but also conceptual qualities. Every one of our aer()sculptures 6aer()sculpture is a composed word formed from aero- and sculpture. The o of aero was replaced by a pair of parenthesis as an open O or 0. This cipher represents the basis of the aerogel’s fractal nanoarchitecture: the empty and untied pockets of air. As we know, silica (silicon dioxide, SiO2) aerogels consist of bonded silicon and oxygen atoms joined into long strands and then into beads randomly linked together with pockets of air between them. has a blue natural color for the same reason that the sky is blue: Rayleigh scattering. The blue color of the sky is caused by the scattering of sunlight off the molecules of the atmosphere. This scattering from molecules (and particles <1/10 the wavelength of light), named for Rayleigh, is more effective at short wavelengths (the blue end of the visible spectrum). Therefore the light scattered down to the earth at a large angle with respect to the direction of the sun’s light is predominantly in the blue end of the spectrum. For particle sizes larger than a wavelength, Mie scattering predominates. This scattering produces a pattern like an antenna lobe, with a sharper and more intense forward lobe for larger particles. Mie scattering is the reason of the sunset color. And now let us more carefully examine -Icare, I care... The torso is thicker than the wing and for that reason when white light scatters at its silica and air components, the torso appears more blue than the blue-transparent wing with the feather’s up-and-down. But this natural blue color is present not only because of Rayleigh scattering but also for a second reason. Behind the wing is a clear background, but behind the torso there is a black background. The aer()sculpture appears blue only when its background is black. In other words, the sky is blue because behind it there is the darkness of chaos. In Fig. 1, there is also another important color: an orange-gold hue. This color comes from a reflective transparent sheet on which the sculpture rests. We can clearly see the shape of the torso, its reflection. But if this is the torso’s mirror image, why is its color not a blue one but an orange one? Only the phenomenon of Mie scattering can explain this visual enigma. This orange light is the light that transpierced the sculpture, traveled to the plastic sheet, where it reflects to our eyes as an orange color. In fact, if we keep the sculpture between our eyes and a light, the sculpture has an orange and not blue hue. These blue and orange colors are why if you have a piece of silica aerogel in your hand, it is as though you hold a piece of sky between your fingers! The same dramatic “cosmos’ creation like” images offers to the viewer the Mie scattering in the work E(r)gonomic (Fig. 3). Here a C-clamp holds a sphere of aerogel. The center of this sphere was intentionally not dried well. As result, the center of the sphere remains white, a transparent white. Thus the white center becomes a gold-orange one, once the light transpierces it (Fig. 3(b)). The above inspection of our aerogel sculptures and their mysterious beauty, which derives from the same natural causes that create the colors of the sky, drives us to our first conclusion that every aer()sculpture is made out of light! And that is because the 99.98& of air that every sculpture contains is not free but captured forever in all these open nanopockets of silica, into all these billions of transparent silica parentheses. But thanks to the supercritical drying, the glass foam forming our sculptures will not be ephemeral. After the formation of the gel (Fig. 4), supercritical drying will alchemize the evanescent beauty of silica bubbles into a frozen-forever magnificence. Only this process and the photography can capture and keep evermore the short-lived foam beauty. The 0.02& of silica and the supercritical drying can metamorphose the silica’s nothingness into ethereality. We know that our digital era is based on sand. Everything is made out of silica, a sand product. Everywhere we have optical fibers for faster communication speeds and silicon devices for data storage. In reality our digital era is nothing less than humanity’s Age of Silica equivalent to the Age of Stone. And if we incorporate all human memory into the silica, we can say that silica is an inorganic DNA! Thus, if carbon is a good basis of life, silica is the ideal basis of artificial life 8For related musings, see the essay on silicon (Si) by R. Hoffmann in Chemical & Engineering News, 81(36) (2003) 56 (8 September).. Thanks to silica and the air, the nonentity of every one of our aer()sculptures matches with our immaterial communication era. 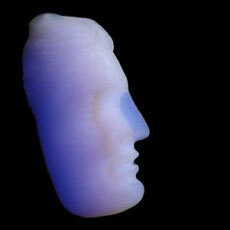 The silica aerogel has no definite geometrical form, our sculptures neither. When you look on an aer()sculpture, it’s up to you to decide where you’ll focus your eyes. Look at Aphroplaston (Fig. 5)-does the viewer focus her eyes on the nose or on the eye behind it? What other sculptural medium permits us to see through the nose? The silica aerogel and its misty substance change the way we look at a sculpture. The space of Silica Aerogel exemplifies what the French mathematician Henri Poincaré named a “representative space,” a space that you cannot measure; you just live in with all your senses. This vaporous and fragile substance breaks the conventional boundaries of Euclidean space. When you look at sculpture made of this extraordinary material you think that it is not a 3-D object, you think that it is a gas, a projection, a hologram. However, this nebulous mass-which is also an optical, a tactile, and a kinetic space-is there, like a memory, like a dream. Just as all the veils of the bride are there without losing her mysterious and indefinite character. The aer()sculpture looks like a ghost image, like a 3-D X-ray: same color, same indefinite transparency, same non-Euclidean space. You believe that it is an illusion, but the sculpture is there, waiting for the tips of your fingers. Seeing this ghost image, the first thing you want to do is to touch it! It’s hard to believe it’s a solid! However, touching or handling the sculpture could destroy its fragile and ethereal structure. An aer()sculpture is a “Noli me tangere,” a don’t-touch-me object because 99.98& of the sculpture is pure nothing. Now let us see how peripheral light transpierces and embraces the silica aerogel sculpture MneC2H5OH (Mnemonic Ethanol), Fig. 6. This sculpture’s form is derived from the head of a Cycladic small idol made around 3000 BCE. We kept the same form, but changed the material from marble to silica aerogel. By exchanging the heavy white marble for the ethereal blue silica aerogel, we give this almost archetypal form the impression of a cloudy cultural memory. In Fig. 6(a) of MneC2H5OH we can perceive three colors and three shapes. The silica aerogel sculpture is on the left side of the picture, positioned on a black rod to help display the sculpture. The attendees of the 7th International Symposium on Aerogels may remember that MneC2H5OH was on display in the main lobby of the hotel and a red laser line scanned the aer()sculpture. The result of this red laser scanning is the reddish profile we see in the middle of Fig. 7(a). As far as the well-detailed ©orange head© seen on the right of the photograph in Fig. 7(a), this is the Mie-scattered paradoxical shadow-reflection 9The photographs of Fig 6 help us to understand the contradiction of the transparent and orange-colored shadow of the sculpture. 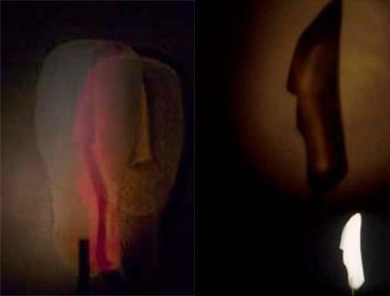 Here we see the small sculpture in profile (at the bottom of the picture) and an immense orange profile projected on the wall, at a distance of six feet from the sculpture.. Thus, by using a white light and a laser beam we can have three different images and colors from the same aer()sculpture. Our sculpture has more than one image and it is hard to understand which of these images is the real one (if reality means materiality). And each of these images refutes oneself. As silica aerogel is doing the same. As we do also with our official and artistic name 10"Making aer()sculpture is a process of both proving and disproving myself (to others)," Michalou(di)s says; "Silica aerogel refutes oneself." Considering the fact that Michalou(di)s has always dealt with the multiple meanings and/or the ambiguity within the thing, his encounter with silica aerogel seems almost fated. BT Japanese Art Magazine 9/2003, Vol 55, No 839, pp. 200-201, special section "Sciencehead," article and translation by Ms. Fumio Iwamoto..
Advanced technology and scientific collaborations are indispensable tools for our entire project; however, it is important to recognize that the driving force of this project is not scientific interest, but human imagination itself. Strong imagination is the communal point between artists and scientists. Every scientist is an artist who looks on the world with a new fresh look. As proof, we have just to remember the first page of Einstein’s 1905 paper on Relativity. The scientist starts his paper by saying that Maxwell’s electrodynamics – when applied to moving bodies – leads to asymmetries which are not inherent in the phenomena… 11A. Einstein, Annalen der Physik. 17 (1905) 891.^. Einstein here indicates something artificial, pleonastic, and therefore anti-aesthetic. The artistic terminology used by the scientist (asymmetries) helps us to understand that the world is one and artists and scientists look on this world from different points of view using as tools a strong imagination and different methodologies. Without the creative desires of people to produce something that has not yet appeared, without sincere trust for artistic collaboration, our project could not have been realized. In this sense, we can describe the aer()sculpture as ©science-oriented art© that goes beyond the existing boundaries between art and technology through free and imaginative collaborations between artists and scientists. One of the aims of this paper is to encourage such collaborations with enthusiastic scientists. 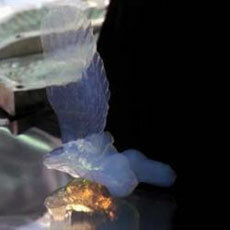 The aesthetically pleasing quality of aerogel is one of the selling points of this material. From today’s perspective, promoters might have well spent some money showing off this aspect in magazine articles of many persuasions to stir up broad-based interest in aerogels. By collaborating in this Art & Science project, one creates Nanoscience History by participating also in the History of Art. It is clear that the price of an innovative piece of aerogel-Art becomes more valuable, day-by-day. In addition, the research and production investments can be covered by signed pieces of Art that a company can use in its publicity. You improve Science through Art, cf. Jet Propulsion Laboratory & California Institute of Technology. The space era material silica aerogel brings its natural beauty, immateriality and ambiguity to the sculptural mediums and opens new perspectives to the artist’s imagination. Expressing silica aerogels artistically also stimulates the scientist to see how his/her research can be applied toward the creation of forms much more complicated than test tubes and disc samples. Hundreds of drawings and ideas await their realization, and for that we need open collaborations with scientists, companies, and institutions. And, of course, this paper is not a useful one. This paper is like a useless (but beautiful) parenthesis. Dr. Ioannis MICHALOU(di)S had received his Ph.D in Visual Arts at the University of Paris I, Panthéon-Sorbonne in 1998. His artistic work till then was caracterized by the use of elastic fabric in site specific installations (_in situ_), envirommental art and public art projects. With his work he had participaterd in a lot of exhibitions and conferences around the world. In 2001 had received the Fulbright Award in order to achieve a post-doc research titled “(IM)material Sculpture” at the Center for Advanced Visual Studies of Massachusetts Institute of Technology. 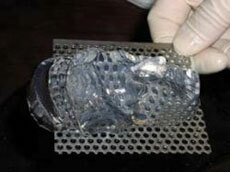 A collaboration with scientists and industries around the world was lanced for the aer( )sculpture project, an Art&Science pilot research concerning the creation of sculptures using novel aerogel materials used in space exploration, which are the lightest solids in the world and have the appearance of frozen smoke.